The Truth about Hollyhocks - Surfing Hydrangea Nursery, Inc.
Hollyhocks (Alcea rosea) are an old-fashioned staple flower of the cottage garden and a favorite of island gardeners. Stately plants with spires of flowers up to six feet tall grace the back of the border or adorn white picket fences. Flowers may be single, double, pastel, or saturated, sometimes even bicolor. In perfect growing conditions, they grace the garden for six weeks or more, as flowers open continually up the stalk while the mature ones fade toward the bottom. Because they are biennial plants, during their first growing season they do not flower, rather they form a basal rosette and store energy for the upcoming summer. During the second year, they flower, set seed and die. Self-seeding is generally sufficient to keep a garden filled with flowers year after year. To be absolutely certain, the nervous gardener will collect seed in September that has ripened on the plant and grow out seedlings right away. Allowing the seedlings to overwinter in a protected area forces the plant into a bloom cycle when growth resumes. Ta Da! Flowers from year to year. All that said, experienced gardeners already know the DIRTY TRUTH about hollyhocks. Hollyhocks are riddled with disease and insect pests! Rust is Real! Snails are horrible hollyhock eating monsters! If your plants make it to flowering with any leaves at all, INCOMING!!!!! Japanese Beetles cover the plants quickly devouring all that remain! Ok Ok, so you can definitely Sluggo for the slimies, and you can spray insecticide for the avian invaders, but what can you do about rust? Hollyhock Rust (Puccinia malvacaerum) is a fungal disease effecting leaves and stems of many plants in the Malva family. Rust is NOT avoidable. Fungal spores are present in the soil, on non-host plants and leaf litter. They are tiny and light enough to be blown hundreds of miles from their point of origin. 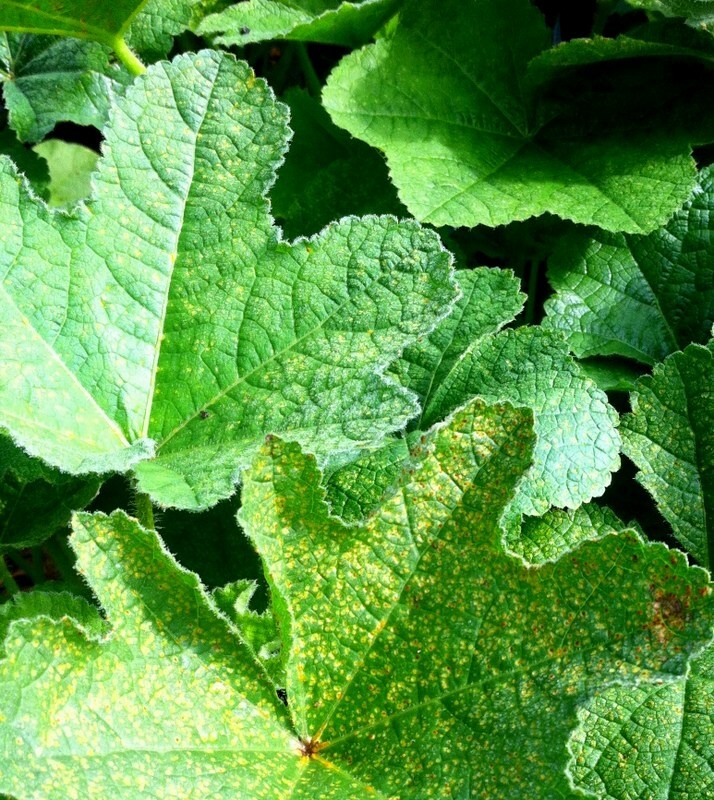 Once the spore lands on a damp hollyhock leaf, it germinates almost immediately, and infiltrates the leaf’s tissue. As the fungus grows inside the leaf it damages the healthy plant cells, weakening the leaf and disrupting photosynthesis. The rust completes its life cycle quickly and causes orange pustules to erupt on the surface of the leaves. Spores are released from these pustules and infect more plants. Control measures may be helpful, but will not stop the infection from occurring. Be sure to clean up the garden very well in the fall. Making sure there is no residual hollyhock leaf litter that may harbor spores is a good start. Try applying wetable sulfur early in the season, to create an inhospitable environment for the spores to grow in. Continue to spray the plants as new growth emerges. Allow good spacing between plants to speed drying of the leaves after morning dew. When leaves do become infected, remove them. Most importantly, plant tall, late season perennials in front of your hollyhocks to mask their foliage. Phlox works well, as do Montauk daisies.